Buitenplaats T Ges Sneek, Hotel Netherlands. Limited Time Offer! Buitenplaats T Ges. The businessmen-friendly hotel "Buitenplaats T Ges" is situated in Sneek. This hotel has 3 stars. Guests are offered the option of taking part in fishing. For visitors who appreciate sports, this residence also offers hiking and sailing. No need to go out for dinner as there is an onsite restaurant. 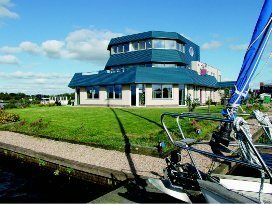 Situated at the watersport industrial park 't Ges, right on the Houkesloot, the waterway between the city centre of Sneek and the Sneekermeer lake, you will find a new hotel, Buitenplaats 't Ges with its restaurant and party centre facilities.